Hi all....hope you're all keeping well and warm and having a good week so far. Took Nippy out for a good run this afternoon, oh my word, was I cold when I got home!!! 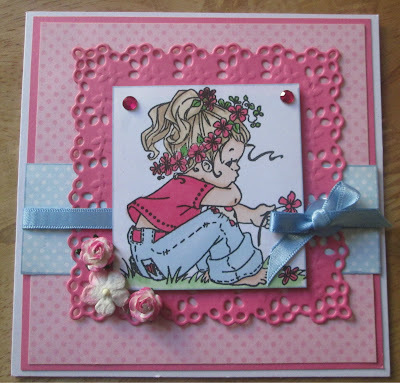 So, I thought i'd bring you all a little glimmer of spring with todays card! I used Sweet Daisy from Sugar Nellie for this one....a bit of an oldie now, but still a treat to colour, and talking of colouring, I have used the promarkers, of course. Have used a Marianne craftables square die. Gems, flowers and ribbon from stash, have used a button to create the bow. This is gorgeous Lisa. I love that image, pretty colours and fabulous layout. Very sweet and lovely in the shades of pink Lisa. Very pretty. Nothing wrong with old images, she's lovely. Thanks for taking part at I ♥ Promarkers this week.